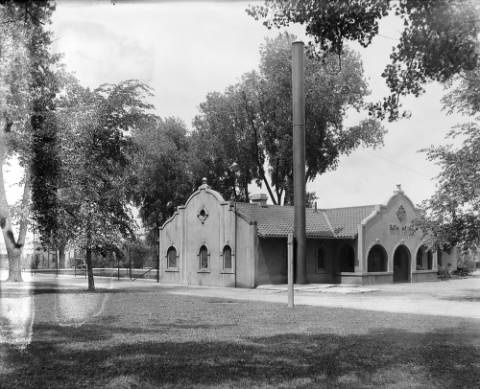 As city council recently voted to officially change the name of Lincoln Park to La Alma-Lincoln Park, and the neighborhood association has taken an interest in addressing concerns about the park’s current safety and future use, I feel that now is a good time to reflect on the history of one of our earliest parks, and what the land has meant to Denver and this community through the years. 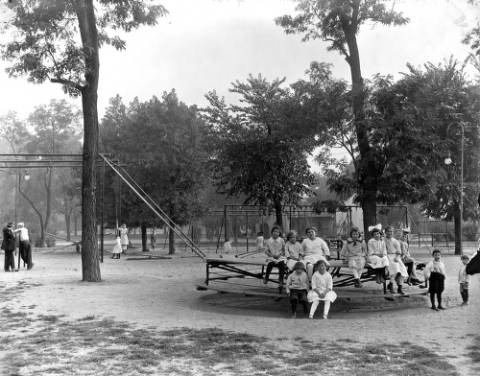 As under-utilized as the park may seem today, readers might be surprised to learn what an important gathering place It once was for the community, the city and the state. If you have read some of my previous posts, you may already know that 4rd Territorial Governor A C Hunt, once resided there before he departed for Texas to build on his success with the Denver & Rio Grande, and construct a railroad to Mexico. His contributions as a founding father of Colorado are significant. 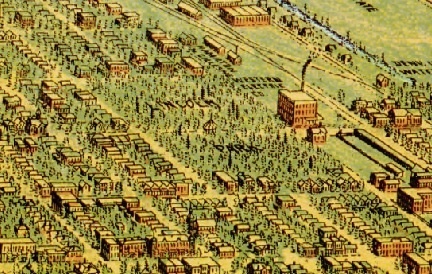 As part of the Auraria Town Company, he presided over the meeting that united the settlement with Denver in 1860. He headed the Vigilance Committee and was Judge of the “People’s Court” to help impose order in the new Wild West, and was appointed US Marshall by President Lincoln in 1862. President Johnson had also appointed Hunt the Ex-Officio Superintendant of Indian Affairs, a position he held in conjunction with his governorship. Known as a peacemaker and friend the native Utes, he is credited with preventing them from uniting with the Arapahoes and other plains tribes, which many believed would had lead to the settlers’ annihilation. When the pioneers of ’59 first set eyes upon the land we call Denver, the plains were barren and devoid of trees, save for some sparse, scrubby cottonwoods along the Cherry Creek. As Hunt built his country homestead in the middle of his 160 acres, he hauled many varieties of great evergreen trees from the mountains to bring life to the land and beauty to the landscape. Like his contemporaries, Hunt believed that Denver’s future would depend on its ability to self-sustain, to produce food for its people, rather than pay exorbitant prices for imported supplies. To this end, he became a student of agriculture and planted many fruit trees, a strawberry patch, and fields of alfalfa and clover. 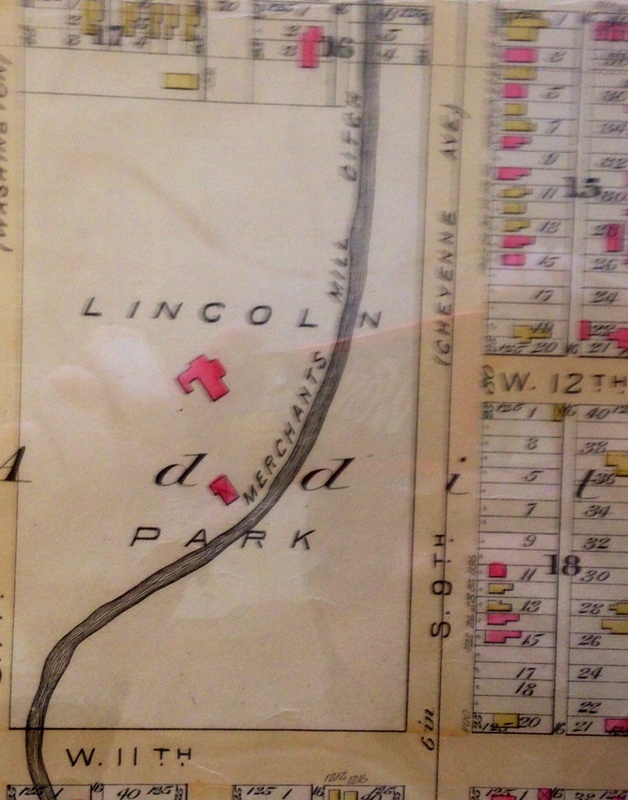 In fact, as one of the most admired estates in the territory, the homestead now called La Alma-Lincoln Park was poetically referred to as “Cloverside.” According to the assessor records, residents living today on the blocks of Kalamath and Lipan between 9th and 10th Streets actually reside in a tiny subdivision amidst Hunt’s Addition called Clover Park. 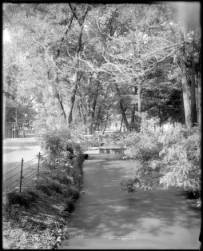 Merchant’s Mill Ditch diverted a piece the South Platte River from south of town, wound through the property, gently curving around the house, through Auraria to the confluence, irrigating the plains along the way. As a charter member of the Capital Hydraulic Company, Hunt likely provoked it’s digging. The house, which once stood directly in the center of today’s park, began modestly, but after several additions, eventually expanded to fifteen rooms in a story and a half. The home was the first in Denver to have a chimney of bricks, which his daughter recalled Hunt hauling by wagon from back East. The structure was covered in white gingerbread shingles and trim, with a stone patios attached to the parlors. 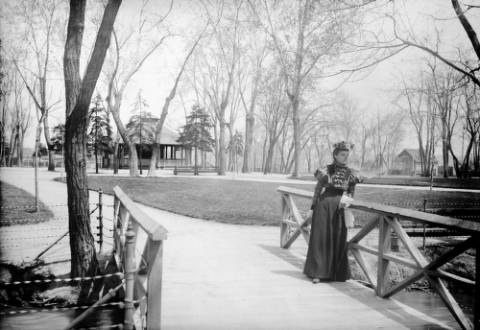 Hunt’s role as politician and pilar lead to frequent and spontaneous entertaining, and Cloverside was known for grand parties with musicians and dancing. Festive lanterns would decorate the lawn as guests traversed the winding driveway that began from the old stagecoach road, later named for Hunt’s friend, Schuyler Colfax. Any visiting dignitary would have had to be invited to the Governor’s estate, including some still known to today. Most notable guests include Generals Sherman, Grant, Sheridan, and Hancock. Hunt’s daughter, Isa, recalled how charming Sherman was with the children, and how he told her the story of Goldilocks while she sat upon his lap. For the ten years after serving as Territorial Governor (1866-69), Hunt was primarily focused on his partnership with General William Jackson Palmer, which entailed scouting and acquiring the land for the Denver and Rio Grande RR lines that began in Denver and ultimately penetrated the Rocky Mountains south and west. 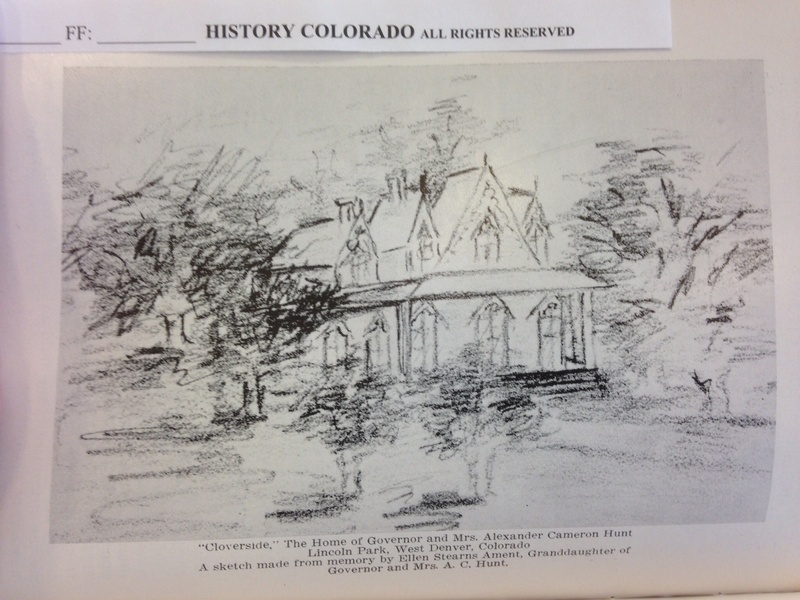 When Ellen Hunt passed away after a long, painful illness in 1880, and son Robert Bruce was shot and killed by a robber at the Bank of Durango in 1883, the governor decided to depart Denver and leave Cloverside behind. Source: Silver Images of Colorado, Ronzio, Richard A.
Denver, Colo. : Sundance Pub., Ltd., c1986. While some sources have referred to the park as a “donation,” it would be more accurate to say that he “gave it away” for $40,000, less the amount it was encumbered by, and $15K less than the city agreed to pay initially. 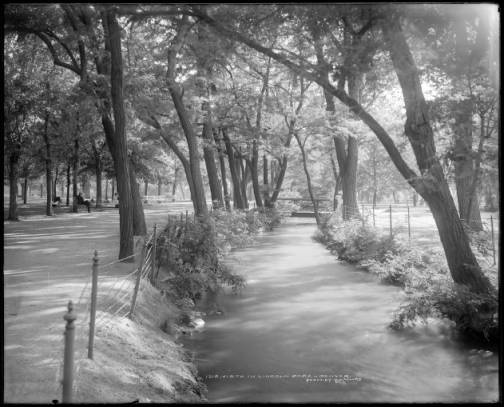 Thanks to the all flooding seen by Denverites, particularly on the west side, the lots across the Creek were already greatly devalued despite all Hunt’s efforts and improvements. Others thought that the negotiation was silly, considering that the trees Hunt planted there were still quite rare in the dusty city, and worth far more than the final price. For the surrounding homes of working men and women, their children, and the generations that followed, the park would be priceless. 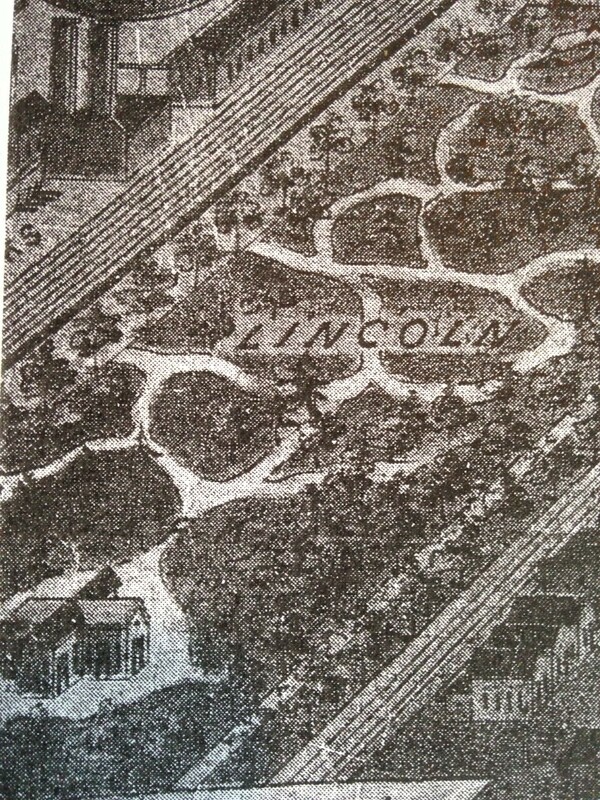 It was formally established in 1885, and named for President Abraham Lincoln, still a popular guy in the day. 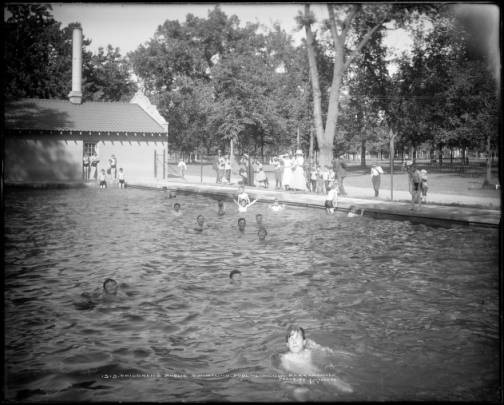 In Mayor Speer’s “City Beautiful” era (1907-1918) the park gained a large, heated pool with men’s and women’s bathhouse facilities, well-used playground equipment and a baseball field. These improvements were well documented in his Municipal Facts publications. The images collected below are representative of the era. 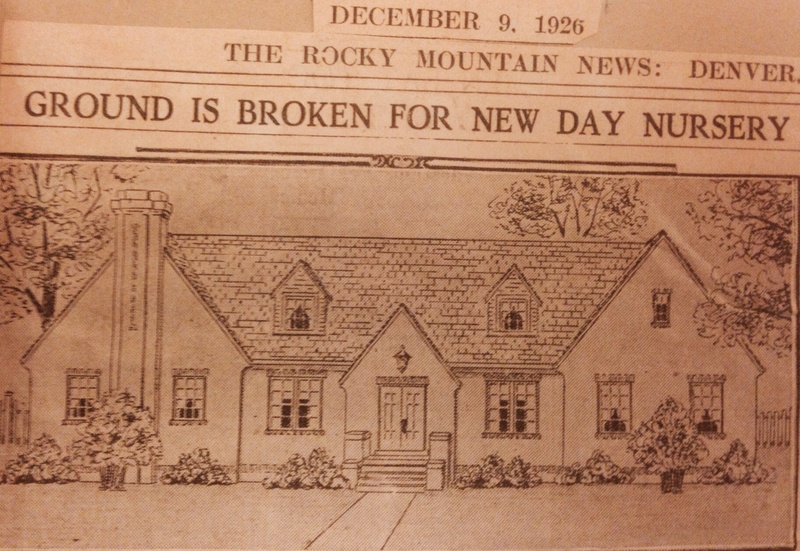 The Neighborhood House Association broke ground on the day nursery in 1926, serving West Side children and mothers for many years in one form or another. Though vacant for many years now, the English cottage inspired structure will soon be renovated and inhabited by The Bridge Project’s excellent after-school program. In 1932, the Daughters of Colorado and the State Historical Society commemorated Hunt’s contributions by planting a Colorado Blue Spruce and erecting a bronze plaque on the site. Sadly, no monument exits today, with no record of the removal. 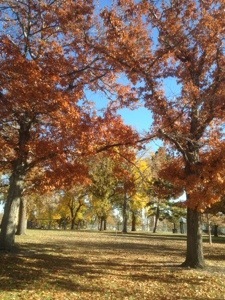 The tree is likely one of the two large evergreens standing tall in the center of the park. 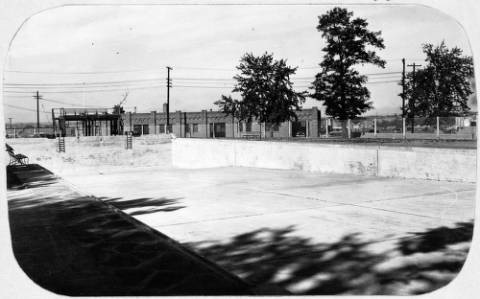 The housing projects constructed on the North and South borders of Lincoln Park in the thirties help mark the transition of generations, where the fortunes of the neighborhood continued to decline into crime and blight. The Chicano movement, beginning in the sixties brought renewed pride in the park, often serving as the center of activities. 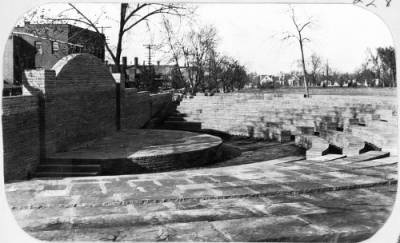 I am not sure yet of the construction date for the La Alma Rec Center, but know it was after 1970. The colorful building and mural are a significant monument to the era, but expect to explore this chapter in our neighborhood history more fully in upcoming posts. In more recent years, the Westside Neighborhood Leadership Initiative helped to provide the lamps that light the baseball field and line the central path through the park. Similar efforts lead to a new playground and picnic area. With the revitalization of South Lincoln Homes underway, the changing demographics and increased density are expected to have an impact on the park. Evidence of gentrification is mounting, yet many residents are not quite comfortable using the park. Currently, neighborhood citizens are taking an interest in park safety and it’s future use. When looking toward the future, it can be helpful to look to the past for inspiration.